This is the third and final part of my response to an article posted by American political analyst Jared Berstein (January 7, 2018) – Questions for the MMTers. In this blog I deal with the last question that he poses to Modern Monetary Theory (MMT) economists, which relates to whether currency issuing governments have to raise revenue in order to “pay for public goods” and whether prudent policy requires the cyclically-adjusted fiscal balance to be zero at full employment to ensure “social insurance programs” are protected. The answer to both queries is a firm No! But there are nuances that need to be explained in some detail. While Jared Bernstein represents a typical ‘progressive’ view of macroeconomics and is sympathetic to some of the core propositions of MMT, this three-part series has shown that the gap between that (neoliberal oriented) view and Modern Monetary Theory (MMT) is wide. I hope this three-part series might help the (neoliberal) progressives to abandon some of these erroneous macroeconomic notions and move towards the MMT position, which will give them much more latitude to actually implement their progressive policy agenda. For space reasons, I have decided to make this a three-part response. I also hope the three-part series have helped those who already embrace the core body of MMT to deepen their knowledge and render them more powerful advocates in the struggle against the destructive dominant macroeconomics of neoliberalism. I have covered this question several times in the past – to counter the almost innate view held by progressives (deficit doves) who think that it might be acceptable to run fiscal deficits in a downturn but then want to run fiscal surpluses on the other side of the cycle to ‘pay back’ the deficits. Various rules are proposed but they all amount to ‘balancing the fiscal position over the course of the economic cycle’ if not pushing for small net surpluses over the cycle. It is a position that is embedded deeply among these ‘deficit doves’ yet essentially reflects an elemental misunderstanding of a range of issues. The most complete account of my treatment of this issue is in this blog – The full employment fiscal deficit condition – which outlines the ‘rule’ that MMT economists consider appropriate for a currency-issuing government intent on advancing well-being, of which, full employment is a necessary condition. To begin, the definition of what constitutes full employment has long been use as an ideological tool to cover poor policy. There have been two striking developments in economics over the last thirty years. First, a major theoretical revolution occurred in macroeconomics (from Keynesianism to Monetarism and beyond). Second, unemployment and broader labour underutilisation rates have persisted at high levels. In past work I have written about the development of the concept of full employment since the 1940s starting with the debate in the 1940s which emphasised the need to create enough jobs to absorb the available labour force. In the 1950s, economists quickly shifted the focus and debated the magnitude of unemployment associated with full employment based on some spurious notion that if unemployment was too low then inflation would occur. The Phillips curve is “god-like” in economics and represents the relationship between unemployment and inflation as a smooth inverse curve. The underlying statistics that were used to get that curve (and since) are highly dubious. Anyway, in this period, fortuitous circumstances meant that unemployment remained low but the focus had clearly changed from generating a given quantity of jobs to being concerned about inflation. Full employment as genuine policy goal was abandoned with the introduction of the so-called natural rate hypothesis (NRH) and its assertion that there is only one unemployment rate consistent with stable inflation. High unemployment persisted. The fact that quits were strongly pro-cyclical made the natural rate hypothesis untenable but that reality was overlooked because it was inconvenient to the ideologues in mainstream macroeconomics. The idea of a cyclically-invariant steady-state unemployment rate persisted in the form of the NAIRU concept, first introduced in the mid-1970s. The NAIRU was constructed as meaning that when unemployment is above it then inflation should decelerate and vice-versa. While various theoretical structures have been used to justify the NAIRU as a viable concept, the conclusion from each is simple: there is only one cyclically-invariant unemployment rate associated with stable price inflation. Of-course they couldn’t admit that so they started redefining what full employment meant. So if you read this literature you will quickly realise that the neo-liberals define full employment as being the NAIRU which is divorced from any notion that there has to be enough jobs available to meet the desires of the available labour force. The NAIRU is a pernicious concept indeed. And we should not forget that the estimates of NAIRUs from time to time in most nations border on the ludicrous. In other words, they are useless for determining whether an economy is at full employment and as a basis for policy interventions. I found this article – Is Low Unemployment Inflationary? – very interesting when it first came out in 1997. It appeared in the Economic Review (82(1)) published by the Federal Reserve Bank of Atlanta. In practice, the concept of a nonaccelerating inflation rate of unemployment is not useful for policy purposes. First, the NAIRU moves around. Second, uncertainty about where the NAIRU is at any point of time is considerable. Third, even if we knew where the NAIRU were, it would be sub optimal to predict inflation solely on the basis of the comparison of unemployment against the NAIRU. A policy of raising the fed funds rate when unemployment falls below the NAIRU may be ineffective…even if the NAIRU were constant, its location were known and all shocks to the economy were to come from the demand side. Implementing such policy would likely induce changes in the expectations and behavior of the private sector an important additional reason to be skeptical about using the NAIRU for policy. 2. Full employment = mass idle labour – detaching language from meaning (June 20, 2016). 3. Full employment is still low unemployment and zero underemployment (June 17, 2013). 4. Full employment definition (December 21, 2012). 5. Redefining full employment … again! (May 5, 2009). 6. Why did unemployment and inflation fall in the 1990s? (October 3, 2013). Full employment will always be defined as 1-2 per cent unemployment (to allow for movements between jobs and regions etc) and zero underemployment. Modern Monetary Theory (MMT) offers a much better way of determining how much slack there is in the labour market. By offering a Job Guarantee – the government knows the minimal volume of net spending that is required to provide jobs at a fixed wage for all workers that want to work but cannot find a job offer for their services. The government knows that when the last worker enters the Job Guarantee office to apply for a job then it has achieved full employment. At that point the policy intervention creates, by definition, ‘loose’ full employment. Why ‘loose’? Because while it ensures everyone who wants to work can find a job at a socially-acceptable base income and can find the hours of work they desire (thus eliminating what we call ‘time-based’ underemployment), there would still be some ‘skills-based’ underemployment in the system. That means that the Job Guarantee might employ a brain surgeon who is out of work due to cuts in health funding and that person might not be doing brain surgery within the public guaranteed jobs. That person would be considered to be underemployed on the basis of their skills. True (‘tight’ or ‘high pressure’) full employment would occur when all ‘skills-based’ underemployment is also eliminated. My estimate is that in a strong economy which offers a buffer stock of jobs via a Job Guarantee, those in the guaranteed pool would not be highly skilled and so the extent of ‘skills-based’ underemployment would be very low. But the point is that the fluctuations in the Job Guarantee pool provide a very reliable daily guide to the state of the overall labour market. When the buffer stock Job Guarantee pool shrinks to historic low levels then it is likely that the labour market is approaching true full employment. That observation would be buttressed by examining wage and price movements. While I will analyse this in more detail tomorrow, the US Bureau of Labor Statistics yesterday (January 9, 2018) released their latest – Job Openings and Labor Turnover – November 2017 – data. In Paul Krugman’s latest New York Times column (January 9, 2017) – Deficits Matter Again – he claimed that the US labour was close to full employment. He made that claim as a posturing device to support his view that the current (low) fiscal deficits in the US were dangerous and hyperinflation was a risk. This bears on the discussion of what actually constitutes full employment. Well, the latest JOLTS data does not really support Krugman’s assertions. The following graph (and I will have more analysis of the US labour market situation tomorrow) shows the Non-farm hiring and quit rate for the US from December 2000 (the beginning of the JOLTS dataset) to November 2017 (the most recent data). 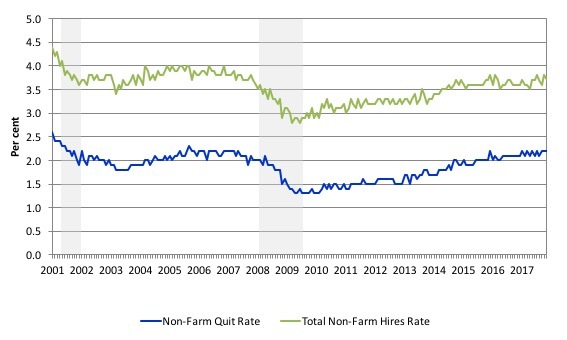 Both the hires rate and the quit rate are still below the pre-GFC levels and certainly well below the levels at the turn of the century. Just those indicators alone, tell us that the US labour market has some slack left to absorb. More tomorrow on the data. He then thinks that if the economy is at full employment (or close to that state), this need to raise revenue becomes imperative. Firstly, the belief that the US government or any currency-issuing government needs “to raise more revenues to pay for public goods” is patently false. The government might have elaborate accounting rules and smokescreens that make it look like they are putting tax receipts into a ‘spending’ account prior to the government withdrawing from that account when they spend but those arrangements are just disguising the intrinsic capacity of the currency-issuer. The underlying reality is that a sovereign government is never revenue constrained because it is the monopoly issuer of the currency. It could change the accounting rules any time it wanted – and, for example, require the US President to stand on his head for a minute before a public dollar can be spent each day. But everyone would know that was stupid and unnecessary. Well the same thing applies to the accounting arrangements and rules subject to tax revenue and spending. A currency-issuing government does not need “to raise more revenues to pay for public goods”. Secondly, that doesn’t mean that the imposition of taxes is not functionally related to public spending. Not being ‘revenue-constrained’ means that a currency-issuing government can always purchase goods and services available for sale in that currency, which may include all idle labour resources. The latter observation provides the capacity to run a Job Guarantee. But, we need to be cautious. Saying the government can always purchase goods and services available for sale in the currency it issues, is not the same thing as saying the government can always spend without concern for other dimensions in the aggregate economy. For example, if the economy was at full capacity and the government tried to undertake a major nation building exercise with large expenditure to improve infrastructure then it might hit inflationary problems – it would have to compete at market prices for resources and bid them away from their existing uses. In those circumstances, the government may – if it thought it was politically reasonable to build the infrastructure – quell demand for those resources elsewhere – that is, create some unemployment. How? By increasing taxes and/or cutting spending. Please read my blog – An MMT response to Jared Bernstein – Part 1 – for more discussion on this point. This statement requires that we understand the role that taxes can play in a fiat currency system. In a fiat monetary system the currency has no intrinsic worth. Further the government has no intrinsic financial constraint. The starting point of this new understanding is that taxation functions to promote offers from private individuals to government of goods and services in return for the necessary funds to extinguish the tax liabilities that the government has the legal capacity to impose. The crucial point is that the funds necessary to pay the tax liabilities are provided to the non-government sector by government spending. Accordingly, government spending provides the paid work which eliminates the unemployment created by the taxes. This allows us to see why mass unemployment arises. It is the introduction of State Money (government taxing and spending) into a non-monetary economics that raises the spectre of involuntary unemployment. As a matter of accounting, for aggregate output to be sold, total spending must equal total income (whether actual income generated in production is fully spent or not each period). From the previous paragraph it is also clear that if the Government doesn’t spend enough to cover taxes and desire to save the manifestation of this deficiency will be unemployment. This analysis also allows for a further insight that goes to the heart of Jared Bernstein’s concern. Government spending absorbs real resources that are owned within the non-government sector. The transfer of the use of these resources from the latter to the government sector allows the government to run its socio-economic mandate (programs). A government does not really ‘own’ real resources. It has to extract services from the non-government sector. In doing so it has to deprive the non-government sector of the use of those resources. Taxation, then, can be seen as the vehicle that a sovereign government uses to ‘free up productive resources’ held in the non-sector, so that it can use them itself. By depriving the non-government sector of purchasing power, the government creates the ‘fiscal space’ to use the idle real resources for its own purposes. If you think about that, while taxation has nothing to do with ‘funding’ the government spending, it still allows governments to spend without inflationary consequences. Once an economy is at (or near) full capacity, then increases in nominal spending growth will be inflationary. If the government is satisfied with its claim on the available real resources at that point then the current tax revenue is sufficient. However, if the government wants to increase its relative size in the economy it must reduce the non-government sector’s claim on the available real resources, to avoid inflationary pressures mounting. That political decision – to increase its relative size – would mean it would have to increase its tax take (at full employment) to provide the extra real resource space to expand its real resource claim. So in that sense, Jared Bernstein’s idea that revenue has to rise with spending has some coherence. Finally, we can briefly address the issue of the appropriate fiscal balance at full employment. The bottom line is that context is everything. Governments cannot appraise the appropriateness of a particular fiscal position by looking at financial ratios or comparing one deficit to a past deficit. As noted above, the most complete account of my treatment of this issue is in this blog – The full employment fiscal deficit condition. What follows is a brief summary. The basic point is that there is no necessity for balancing a fiscal position of a currency-issuing government at any point or over any span of an economic cycle. Many progressives claim that once the economy reaches full capacity, the government has to raise taxes and/or cut spending to ensure a balanced fiscal outcome – or else face inflationary consequences. This is an argument that so-called ‘deficit doves’ make and it is a position that is representative of the mainstream Post Keynesian position. There is no question that if nominal spending continues to grow at a rate that outstrips the capacity of the productive sector to meet that spending with real output then firms will move to price-adjustment and inflation will result. MMT puts that generally accepted observation at front and centre of its analysis. In part, it helps us to understand the previous discussion over the role of taxes. For there to be real space in the economy for the government to spend, the non-government sector has to be deprived of its capacity to utilise the real resources the government seeks to command. The – full employment fiscal deficit condition – is a core MMT ‘fiscal rule’ that allows us to appreciate the appropriate fiscal balance at any point in time. At full employment there is no necessity for the fiscal balance to be zero. Under some conditions, a fiscal surplus might be appropriate. In other situations, which will be more often encountered by nations, continuous fiscal deficits will be required. A zero spending gap occurs when there is full employment. The role of government fiscal policy is obvious – to ensure no spending gaps persist. It becomes obvious (and incontestable) that if the non-government spending sources decline from a given position of full employment – due to a preference for more saving (less consumption) or lower levels of capital formation (investment) or higher imports, then the only way that the spending gap can be filled is via a fiscal intervention. That is direct government spending and/or a tax cut (to increase private disposable income and stimulate subsequent private spending). What about the maintenance of full employment? The fiscal position (deficit or surplus) must fill the gap between the savings minus investment minus the gap between exports minus imports (with net income transfers included). That relationship can be easily satisfied at levels of economic activity that are associated with persistently high levels of unemployment. Keynes’ General Theory was important in history because it showed how market economies could get stuck in these sort of high unemployment steady-states. But, to maintain a full employment level of national income, which is generated when all resources are fully utilised according to the preferences of workers and owners of land and capital etc, the fiscal deficit has to be sufficient to offset the saving and imports that occurs at that level of income, less the sum of private capital formation and export revenue that is forthcoming at that level of income. Where G is government spending, T is total taxes, M are imports, I is private investment and X is exports. Yf is the full employment level of income and the sum of the terms S(Yf) and M(Yf) represent drains on aggregate spending when the economy is at full employment and the sum of the terms I(Yf) and X represents spending injections at full employment. If the fiscal deficit is not sufficient, then national income will fall and full employment will be lost. If the government tries to expand the fiscal deficit beyond the full employment limit (G – T)(Yf) then nominal spending will outstrip the capacity of the economy to respond by increasing real output and while income will rise it will be all due to price effects (that is, inflation would occur). But also note that the right-hand side of the full-employment fiscal deficit condition will typically not solve out to be zero. If it did, then at full employment, the appropriate fiscal position would be a balance. If it solved to a negative outcome, then the appropriate fiscal position at full employment would be a surplus. But there is nothing necessary for those outcomes to occur and as history tells us, they usually will not happen. So the spending and saving conditions of the external and private domestic sectors provide the context for appraising the appropriateness of the fiscal outcome at the benchmark of full employment. This benchmark is what Jared Bernstein terms the “structural” fiscal balance. At full employment, a continuous fiscal deficit will be likely to satisfy the overall saving desires of the non-government sector. History tells us that. That continuity of net government spending will not be inflationary because it is filling a spending gap. It is the normal condition we would expect. I hope this three-part series has been of use both to Jared Bernstein (given he asked the questions in the first place) and the broader MMT audience who would like to deepen their knowledge of our approach. And remember, just as Jared Bernstein noted in his blog – this three-part series is a ‘peaceful’ offering. There was no martial intent in my three-part response. So a week after I said I would not write detailed blogs each Wednesday I have written one. But I did say I would do so if it was to maintain continuity in a multi-part blog post. So my ‘Wednesday rule’ is intact :-). ‘Well, the latest JOLTS data does really support Krugman’s assertions.’ I assume it’s ‘doesn’t’. You wrote that quits are pro-cyclical. Aren’t people more likely to quit during a boom and less likely to do so during a recession? Doesn’t that mean that quits are anti-cyclical? In this formula, what is ‘S?’ (G – T) = S(Yf) + M(Yf) – I(Yf) – X I’m thinking net savings, but it doesn’t say in your article. Bernstein starts & ends with an out-of-paradigm assumption, so arguing from his proposed context only extends further momentum to an illogical train of thought. Bill Mitchell himself concludes that “context is everything” – but only after ignoring the Principle of Prior Plausibility and adopting Bernstein’s broken semantics. You can’t win a Sophist argument that way. E.g., you can’t convert a believer to be an atheist no matter how many times you tell him there is no GOD, no DEVIL, no HEAVEN and he’s not going to HELL. All you do is further cement in his mind the very constructs you’re asking him to stop using. Just start and end with the fact that one doesn’t need to tax in order to get “fiat” – and have done with it. Any other verbiage only delays Bernstein’s using logic to align those fundamental definitions. To me, all arguments over fiscal policy stem primarily from broken semantics. Since the date of formation of every nation state, 2 things occur in parallel. More citizens are arbitrarily created (as babies & immigrants). More sovereign currency units are arbitrarily created, to denominate the increasing inter-personal credit that the growing # of people can extend to one another, individually & via the compounding effect of teamwork (i.e., the return on coordination). How do humans track population growth and it’s dependent variable, currency supply? We let a census bureau track population changes. No Problem. EXCEPT that DEB requires every “+”entry in one entry column to be matched by a “-“entry in another column, and then DEB jargon labels the appearance of “+” and “signs” as matching “surpluses” and “deficits”. That’s just local semantics, for convenience, as occurs in all professions. It doesn’t mean that what a DEB accountant calls a deficit is what Jane & Joe Sixpack calls a deficit, e.g., a jobs deficit. If you can’t define portable terms, you can’t have a reasoned discussion. If Census used DEB jargon, we’d arbitrarily be lamenting a yearly “deficit” in babies, and tasking future generations with paying back all the babies to some imagined source. Storks? Worse, we’d call population growth a national “debt” and track all the babies we’d have to return to the womb. Once confused by semantics, we might even be dumb enough to insist on “Balanced Population” – and call for “birth as you die” policies. Just ask Bernstein to square those equal analogies. And don’t cave by using Bernstein’s broken semantics. You have a pretty confusing way to clarify things. I don’t even understand why you use the word ‘semantics’. One reservation to quantify the private sectors saving desires is impossible. Spending choices are never free they are always income dependent. Generally saving ‘choices ‘will grow with income. This has been a great series of posts and I’m pretty sure you answered Jared’s questions. Whether he can accept the answers is a different matter. And even if he does accept privately that MMT describes how the economy works more accurately than the alternatives, it may be that a calculation gets made as to what is the most politically effective way to argue in public for the policies we (liberals in the US) want our government to undertake. Since that is really his job at the moment, that calculation might not favor MMT. I remember that Dean Baker, who often works with Jared Bernstein, seemed to explain it that way when he discussed MMT. And I, who am hardly a public figure, know from personal experience just how difficult it can be to be taken seriously when explaining to friends and family how the US government really doesn’t face any “financial” constraints when talking about health care, or social security, or deficits, or any number of things. They tend to look at you like you fell off your rocker and hit your head too hard. But that doesn’t mean it is ok, especially for an academic, to publically say one thing (for expedience) while privately accepting there is a more accurate way to describe things. Or to ignore research and explanations that MMT provides that would demonstrate that what you were saying is inaccurate. I’ve been reading Bill Mitchell for about seven years now. At first I was highly skeptical about MMT but thought- hey, politically this guy is on our side. That is often good enough. As I read more and learned more it became wow- this isn’t all pie in the sky nonsense and I began searching for good arguments or facts that would show MMT was wrong. That should be easy to do because MMT is mostly based on description of how things work and a chain of logical assumptions off of those. All you would have to do is show that a link was broken somewhere, or that a few of the descriptions were wrong. That was surprisingly difficult to do- many other economists didn’t even want to discuss MMT, and some wouldn’t let you mention the name of it, or acted like you were a moron for asking about it. Well, moron or not, I haven’t found any good refutations of MMT yet. But still looking and willing to learn them if they are out there. What I have found instead are fundamental inaccuracies in standard economic theory even as explained by eminent economists like Paul Krugman- people that I would usually agree with politically. I used to harbor ideas that Mr. Bernstein still holds (deficit now then we pay back our debts later). I’m still waiting for the military to turn a profit. Using military spending as argument for more spending on citizens is not enough though. Having a coherent story from the mainstream and knowing it by heart allow us to have the conversation we should be having. Mosler was right that Dr. Mitchell writes faster than people can read. ^^ I can’t keep up with all the reading! Our evolution is moving in the direction of work becoming a legal right, however—for instance the law passed by Congress in 1978 which provides us with the “legal authorization” to create a “reservoir of public employees” anytime our UE rate rises above “3%” [Humphrey-Hawkins–15 USC § 3101]—i.e., to limit our UE rate in America to 3%, permanently! The Trump/Republicans stiff this concept, and yet, we can do this without adding a dime to our deficit—i.e., for instance, two deficit-neutral examples: HR 1000, and THE NEIGHBOR-TO-NEIGHBOR JOB CREATION ACT [NTN, Amazon]: A federally mandated, Social Insurance, owned by employed to provide a fund to hire/train our unemployed. Jobs beget jobs, and for a modest 4% of salary policy cost, NTN will create more “private-sector” jobs in 6 months—than our current path in 6 years! And finally, finding work to be a legal right will address 95% of our social ills—not the least of which, in America, is our insidious incarceration rate—and our first step is incorporating in our mind-set the truism: FULL EMPLOYMENT IS A PRO-MARKET CONCEPT [Amazon]. A brief expansion re Humphrey-Hawkins—which becomes more relevant each day in our 21st Century economy. Studies show that a third of our jobs in America will be lost to robots by 2030—some predict more. And yet we are still paralyzed by the hysteria that grew out of McCarthyism—resulting in the fraudulent propaganda, since, that “the market can provide anybody wanting a job, with a job”—it is PURE BS—and in the ineptness of this fraudulent belief: It has not produced a UE rate of 3%, or below, since 1953—leaving millions jobless in its wake! For instance, we stood on one foot, and then the other—waiting on the market to provide jobs for Flint/the Rust Belt—as we watched them rot into decay—and with the repressed anger in this region boiling over via a vote for Trump—which could result in a fatal blow to America! That is, there are extremely serious consequences in not evolving…and accepting work as a legal right! Good recap of all the critiques and counter arguments. Still I sometimes don’t fully understand the sectoral accounting and its relation to output/GDP income etc. Am I getting it when I imagine a tiny country with an economy with one company employing all 10 citizens of that country making widgets. If they pay their workers $100 in total making widgets ($10 each). But the workers only spend $90 back to the company to buy its output and the other $10 is saved or spent on imports. The company will not sell all its output of widgets and thus lay off a worker. But if the government came in and spent $10 on widgets for itself everyone remains employed because all output would then be purchased. Is that sort of it??? An excellent comment that mirrors my experience too. Just cannot fault the logic. Thank you for providing this timely opportunity for revision, as well as the ammunition for the effective refutation of anti-MMT argument. I did not know about Humphrey-Hawkins. Thanks for pointing that out. If it is true that congress is required to maintain unemployment at 3 percent. I wonder how they are ignoring the law. Oh well… I got some reading to do. You are right on your observations. Last time economy was this bad, nationalists all came out. Now, we have a resurgence of nationalists. Yes. I think your analogy is correct. Sorry all for posting three comments when I could have put them all into one. When I started explaining MMT gov deficit to my father, he kept denying thats the case. He kept saying deficit is bad and there is no way an economy can grow with deficit. Now he would NEVER say something like that. Whenever he talks about the economy, its usually around the standard of living and not focused on gov deficits. I posted the following comments at new economic perspectives which linked this article in its reply to Mr. Jared Bernstein. The best solution that I can come up with is that the world has to develop say 10 different multinational regional conferdetations or federations which can then (hopefully) reach treaties to allocate resources in a reasonably humane manner and to combat global warming and the destruction of the oceans. I could go on but that is enough for today. Everyone? Every government? Pollution is everywhere. Many countries still use fossil fuels. Depends on the problem, right? Sometimes problems can’t be fixed. Otherwise, you fix problem by doing proper investments and ask if you are doing enough. If you are polluting too much, then invest in clean version of whatever you are doing. With MMT, you have more space and leeway to work with. MMT counters that money excuse you mentioned, so we can assign people/resource to do important work that has been neglected. Educate people on being frugal in consuming real resources and be environmentally aware? Raise taxes so people can’t do/buy stuff that is unfriendly to the environment? Renewable and unrenuable resources will become scarce with or without MMT. I would argue that it become scarce without MMT because people don’t take care of the problem using the money excuse. All these policies need money, so again MMT lets you do these things. Imperialists and rentiers have always exploited everyone, especially those who are poor and vulnerable. Yes, the powerful have been able to and have always exploited others. You are right, USA imperialism needs to be taken down. I must ask though: How many people are going along because they are barely putting a roof over their head or their jobs depend on these exploitations? A JG gives us security because we know we will always find something worthy to do and quit our jobs if we think that it’s a bad for society. Scums must be stopped. I don’t see this is an inevitability. We try our best to make the world better. If we fail, at least we tried. Furthermore, MMT doesn’t exclude one from holding progressive, socialist, or anarchist views. For the rest of your comment, I just don’t agree that we ought to have a world government to live sustainably and in harmony with each other. What the EU shows is how dysfunctional that can be. A big problem is that we have been worrying about the wrong thing. Because of economic blindness, people worry about obtaining money by whatever means possible, instead of how to live sustainably and happily. To maintain price stability government needs to be an effective buyer, a master of procurement and a tough negotiator for value, which through sheer size within its currency area forces everybody else to act the same if they want to stay solvent. Curt Kastens, I think Tom pretty much nailed it in his answer above. MMT does not offer the solution to all the world’s problems and it doesn’t pretend to do that. What it does show is that a sovereign government can employ the idle resources available to it to attempt to achieve a variety of goals. As Tom points out, this could be an improvement over what we do now as far as the environment. As it stands today, we live in a world of nations, where the ultimate responsibility for the welfare of the people of those nations mostly rests upon the governments of those nations. That may not be the best way the world could be, but that is where it is. I don’t expect MMT, or any theory of economics, to provide an alternative to national governments. And I’m not sure most people would welcome one. Tom, I really really like your anwer that is four thumbs up from my two hands. MMT certainly could get us going in the right directions, if used properly. But I still think that international coordination will be neccessary to create a sustainable society. To have a chance for an international agreement on the types of coodination needed the of the people of the industrialized countries, on aggergate, the United States in particular, are going to have to make sacrifices. Of course I do not expect those making near a minimum wage in such countries to make sacrifices. But a couple examples of what I think would be reasonable are in the short term, no family automobils larger than a compact, or rationing airline travel. I agree. US must make concessions. Yes, more coordination will be good too. I won’t even call these sacrifices. The US has been abusing its superiority for decades. As an American, I often consider myself very lucky that I may not have to make reparations for all the murder we do around the world. To be fair to us: we didn’t make this. We weren’t the one who invented junk economics or polarized the society. We weren’t the ones who told US army to invade other countries. Elites and wealthy people made the world into what it is now. Yes. I think producing less beef is also a great way to tackle environmental problems. “even”? “eminent”? Come on, the man’s peddling junk economics, which at a fundamental level “explains” nothing. I’d like once again to express admiration for Bill’s untiring energy and perseverance in propagating what I don’t doubt to be a far saner and better-argued case for change, from a progressive perspective, than any other that I know of. More power to his elbow, say I. Nevertheless I continue to have grave doubts about MMT’s fixation with the job guarantee. It has assumed the place in MMT doctrine which the Holy Grail had in Arthurian legend. I think that is unhelpful to MMT’s cause. There’s no space to go into all the counter-arguments here, but I’ll advance one or two. Granted that the consequences of creating un- or under-employment as a conscious instrument of economic management, and most especially with the aim of achieving a “balanced budget”, are unacceptable (as well as completely irrelevant to solving the problem purportedly addressed), is a JG axiomatically the best or the only alternative? The idea is that effective, focussed, MMT-mandated economic management is possible only so long as means exist to ensure that full utilisation of all available productive resources is at all times assured – thus by taking full employment as a given, policy is enabled to be concentrated without distraction upon the real elements of “functional finance” and upon keeping their magnitudes in that (MMT-mandated) relationship to each other which circumstances at any given time dictate. Hence the usual characterisation of the JG as creating a “buffer stock”, available for redeployment (self-selecting not imposed) to meet demand, or able to absorb displaced workers (ditto), as economic activity waxes and wanes. Very laudable in intention no doubt – but to my mind utopian, and smacking of social engineering. The theory equates “having a job” with some kind of nirvana (an exaggeration I know). Acknowledging that our materialistic, protestant-work-ethic dominated, culture does indeed tend to make that equation, does it have to be swallowed quite so unconditionally? I’m afraid that the suspicion has crossed my mind that MMT does so not because of any intrinsic merit that notion possesses but only because to do so fits so neatly into MMT’s theoretical, mechanistic, framework. I say “mechanistic” because the component parts of that “buffer stock” are not units of some commodity like wheat but individual human beings each with their own personal set of aspirations and values. Of course because of the way modern societies are organised those individuals have to have some way (assuming they don’t take to crime) to feed, clothe and house themselves and perhaps families, and over recent centuries that has always tended to translate into the universally-felt compulsion to “get a (wage-paying) job” regardless of its nature. But jobs conjured out of thin air fool nobody, least of all those doing them; if there is a genuine, perhaps societal, need for particular projects to be undertaken which the non-government sector sees as having insufficient profit-potential then let the necessary capital investment be provided by the government sector and the employment resulting therefrom be through the medium of employment organised in exactly the same way as in any private firm. The jobs created are then no less “proper jobs”, no less permanent or impermanent, than any other jobs. No unconditional job guarantee (still less any “right to employment”, a crackpot idea IMO) *need* be presupposed in order for this to happen:- it is up to those holding the levers of economic management to bring about the results aimed-for by indirect, but natural, means such as this not through artefacts like a JG. Granted there will always still be a gap between aim and outcome – but so in an imperfect world will there be with a JG: it would take a differerent form but it would still be there. I think I’ve gone on long enough, though there’s much more that could be said. Robert @ 22:12- Yes ’eminent’ probably wasn’t the best word to use. ‘Famous’ might have been better or some other word that described that he writes two columns a week in a very important newspaper, was an economics professor at one of the most prestigious universities in the US, and was awarded the economists’ version of a Nobel Prize. But despite all that, and despite that politically (usually) what he advocates is generally what I would want policy-wise, MMT points out some fundamental inconsistencies in his explanations of how things actually are. I mean, for example, the whole ISLM model he always is touting is really very wrong at its roots. It is based on a loanable funds type theory that MMT totally shows is wrong for fiat currency issuing governments. As far as your doubts about the importance of the Job Guarantee to MMT- In my opinion, it is very important. Theoretically, because it is part of the automatic stabilizers that MMT relies upon to correct for deficient aggregate demand and to moderate demand side inflation. Economically, unemployment is recognized even by mainstream economists as a total waste of resources and perhaps the largest problem capitalistic societies face, even if many of their models don’t allow for involuntary unemployment in the first place. Socially and psychologically, the problems unemployment can inflict on individuals and their families are well understood to be very significant. And MMT shows a way it can be ameliorated. And shows how it is not an issue of ‘affordability’ for a sovereign government. There might be other criteria for which to judge a proposal for policy but I’m not aware of it. Wrt the JG, it’s voluntary. If you’re unemployed and you’d rather sit at home and play the flute all day, paint pictures, or learn Hungarian, that’s fine. If, however, you need to earn some money, but the open job market doesn’t have a place for you, rather than get £60 in unemployment benefit (or £70 from a UBI), the JG will find you something to do that suits your abilities (and/or train you up to do something you’d like to do but don’t currently have the skills for) and pay you a proper living wage (~£10ph?) for your labour. As MrShigemitsu pointed out, JG is voluntary. JG also gives people a safety net and transition job for people who had no chance to earn income. Some people may have gotten into trouble with the law but they need a second chance–they will NEVER be able to compete with regular workers who didn’t get into trouble for even government jobs. You plan of having government private firm will fall flat on its face in terms of providing employment to these people. Long-term unemployment completely wrecks a person both mentally and socially. I suspect it even translates to the next generation. Its just too brutal for many people and you need to fix it. People need some fulfillment and self-worth in their lives. A job that allows people to contribute make better citizens becaue they now have a stake in their environment. Its not even about catholic work ethic man. Many people don’t find it okay for someone to get paid for doing nothing while they work their butts off. Isn’t that a criticism for BIG? Also in reply to Curt Kastens. I am a part time activist for the Australian Greens and I am very grateful to the MMT academics for proving the case for full employment and the ability of national governments to issue sufficient currency so as to fully engage the productive capacity of an economy. Your concern about any associated global increase in resource consumption is extremely valid and important. The solution in my opinion is proper democratic processes uncorrupted by partisan mass media that should eventually enable the election of environmentally and socially conscious progressive parliaments and governments. Such governments must then allocate resources to reducing our environmental burden such as rapidly transitioning to clean energy, greatly expanding the use of public transport and healthy transport options like bicycles and walking, reducing car dependence and transitioning to New Energy Vehicles, improving the energy efficiency of dwellings, better urban design, greater use of rail freight over road freight, reforestation, improved agricultural practices including less meat consumption, preservation and restoration of the natural world, regulations to improve the durability and repair-ability of consumer goods, increased foreign aid and so forth. Global warming is the biggest challenge we face and Dr James Hansen’s solution of a carbon fee and with a 100% dividend to all citizens is probably the most cost effective and politically attainable. Globally we must reduce greenhouse gas emmissions by 3 to 6% p.a. and currently they are still increasing. Governments should also at the same time be able to ensure free high quality education, universal healthcare, childcare, affordable housing, pensions and social support for the needy. This whole package can be called a ‘Green New Deal’ and without harnessing the talents and efforts of all and the optimal application of fiscal policy such a program would not be possible to the extent and urgency needed. So I say to Paul Krugman and other prominent economists who stubbornly continue to propose the nonsense of balanced national government budgets over the economic cycle – learn your trade or get out of the way as humanity and the earth cannot wait. Thanks Curt, Tasmania was the birthplace of Australia’s Green movement and Environment Tasmania are a fine organisation but alas I am just one of many commentors on their website. The bit critics of the Job Guarantee miss, is that the Job Guarantee isn’t about money. It’s about time. Very simply why should the farmer work past Tuesday – the point at which they have created enough for themselves and their machine providers – simply to allow you to have ‘free time’. What you are asking is for the farmer to give up their free time so you can have free time, but for nothing of material value in return. The farmer isn’t going to stand for that in any system of free exchange. That’s what the money illusion of Income guarantees ensures. To paraphrase Guy Standing: “If the rich can steal from the workers, why shouldn’t we be able to too”. Of course the workers should know their place and learn to steal from themselves. The Job Guarantee is a way for you to give up X hours of your time in the service of others, so that they will give up X hours of their time to service you. That’s the essence of an exchange economy. The tenets of Adam Smith still apply. You get much greater productions with specialisation. So we need the farmers in their fields for the full week, just as we need the operatives in the factory for a full week, and the machine designers at their CAD station for the full week. And we already know what happens if you try to ‘share out the work’. If you hand land to people that don’t know how to farm, then you get hyperinflation. That was, after all, the cause of the collapse in Zimbabwe. The Job Guarantee keeps the plates spinning on an advanced production economy. All the usual arguments, just airily dismissing criticisms without refuting them. Or setting up straw men in order to knock them down (I never suggested that large-scale involuntary unemployment was anything other than deplorable and societally corrosive, so asserting that is not a refutation of my argument). But I wasn’t expecting to make any converts, not here at least. “And we already know what happens if you try to ‘share out the work’. If you hand land to people that don’t know how to farm, then you get hyperinflation” sounds to me not a million miles from my argument, but doubtless your actual point is far too subtle for me to grasp.